I went looking for "blog inspiration" today as a subject wasn't quite coming to me. The sun was shining, it felt like a great day to get a bunch of errands done around town and sometimes some little thing someone will say will inspire me. Maybe I was trying to hard. Seemed like people were a bit slow and grouchy today. Maybe it's just Monday, maybe people were up late last night watching the Oscar's and not so happy to be at work today. I didn't hear any inspiring words. So I turned to nature for inspiration and went for a walk in the woods. Everything seems very quiet- kind of as though nature felt kind of slow and sleepy today too, and that didn't seem to quite match with the bright sunshine or how I felt inside. I met my ducks and had a conversation but I've already written about them http://pixiedusthealing.blogspot.com/2012/02/animal-signs-duck.html. Nothing else seemed to be "out and about". I was starting to think it would be a 'blog-less" day when all of a sudden I came across a flock, and I mean flock of robins! Ahh.. now that's what I was looking for. I saw a flock of robins on someones lawn the other day. It wasn't just one or two birds. The whole lawn was covered. I casually mentioned it to someone. Turned out he was quite an expert in birds and he explained that they really aren't "our robins". It's still too early for "ours" to appear. Apparently these are robins that belong in Newfoundland but have made their way in land because of very stormy weather off the coast. Robins are definitely an animal sign according to both Steven Farmer and Daniel Mapel. Farmer in Animal Spirit Signs suggests the appearance of robin means it's time to let go of anything in your life that's outmoded and stagnant. 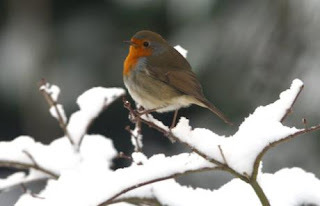 He writes that Robin is a symbol to let of attachment to drama and allow the joy to flow in. Mapel, in Into the Heart of the Wild, writes that the Robin is a symbol of nurturing and a symbol to look after yourself in gentle ways. He also suggests Robin energy helps us create harmony out of chaos. They are considered a grounding energy. In my part of the world, the robin is unquestionably considered a sign of Spring. The first appearance of the robin is a welcomed event no matter who you are. Maybe that's why the thought that the robins we were seeing weren't quite "ours" was a little disappointing. Maybe spring still isn't really here yet. It turns out there is a storm barrelling towards my part of the world with the potential for some snowfall, high winds, maybe some rain. So that explains the quiet in nature it seems. Often the woods is pretty quiet just before a storm. That also explains the way some people are feeling today. Some people seem to react to impending storms with aches and pains, unsettledness and sometimes a bit of quiet grouchiness. Other people react to impending storms with a sense of anticipation, a bit of excitement- which also explains my mood today. So given an approaching storm, maybe those robins really are Newfoundlanders that have decided to extend their layover a bit until the winds are a bit calmer. Newfies are good at that kind of thing. They can make what others see as adversity an adventure. They seem pretty good at nurturing and making a party out of just about any situation- harmony from chaos I guess. I'm going to interpret the robins I saw as a symbol of that new life and happiness that both Farmer and Mapel write about. I don't think it matters if the Robins are newfies or "home growns'. I don't think they are forecasting the weather as much as they are forecasting a sense of revitalization, opportunities, and new growth. And that can happen in any season, and from my point of view, is always welcome. "Long may your big jib draw" (may the wind always be in your foreword sails" and be careful it sounds like it might get "some rough out" tonight!